Music & Literature no. 5 celebrated its U.S. release on November 20th in the intimate acoustic of Victor Borge Hall at Manhattan’s Scandinavia House, where a packed audience was treated to a program of music and spoken word centering around the issue’s three featured artists: Finnish composer Kaija Saariaho, Norwegian writer Stig Sæterbakken, and Chinese author Can Xue. In keeping with a publication whose initial 2012 appearance was as unexpected as it was welcome, there were even a few piquant surprises, chief of which was a world premiere of a new piece by Saariaho. Camilla Hoitenga performs Laconisme de l'aile for solo flute. Rehearsing on stage until the very moment the doors opened to welcome the bundled crowd were five of Saariaho’s closest musical collaborators, one of whom was the flutist Camilla Hoitenga, who has been working with Saariaho for more than thirty years. And while the evening was billed as "Music & Literature with Kaija Saariaho," the Finnish composer’s literate style made the presentations and readings of work by Sæterbakken and Can Xue feel like natural extensions of the central proceedings. It was precisely this element of diversity that unified the entire program: many languages, cultures, disciplines, and aesthetics were brought together—all with a dynamic verve heightening one’s attention to each of the works presented. Flutist Camilla Hoitenga and cellist Hannah Collins perform Mirrors. The evening’s tone was set by Saariaho’s Laconisme de l’aile for solo flute, the oldest work included on the program and possibly the composer’s first to bear her inimitable stamp. Inspired by Saint-John Perse’s Oiseaux, a salient excerpt of which was read prior to the performance (first in French by Aleksi Barrière then in English by Hoitenga), Laconisme de l’aile introduced what has become one of Saariaho’s signature musical ideas: the fusion of poetic recitation and instrumental sounds. Here, the resonating body of Hoitenga’s flute was used to "amplify" words, syllables, and phonemes taken from Perse’s incandescent text. Hoitenga also revisited the gambit in the piccolo miniature Dolce tormento, whose sound-world was steeped in the flavor of the Italian language, courtesy of a Petrarch sonnet. In both works and the brief duet Mirrors, for which Hoitenga was paired with Hannah Collins’s cello, the music was delivered with incisive, probing ease. Kaija Saariaho reads from "Earth and Air." Danish writer Naja Marie Aidt subsequently took the stage to speak about Stig Sæterbakken, whose work she treated with exceptional warmth and insight. Making reference to a compendium of droll Nordic stereotypes (to which Saariaho also alluded), Aidt painted a picture of an artist whose unflinching pursuit of truth frequently took him to the precipice of a private abyss. Naming Sæterbakken "one of the most important writers of my generation in contemporary Scandinavian literature," she read a selection from his essay "Sacred Tears." Editor Taylor Davis-Van Atta followed up with words from the Norwegian’s "Why I Always Listen to Such Sad Music," a disquisition on the impossibility of a "perfect" musical performance. It made for an inspired programming coup, as the next piece up was Saariaho’s Nocturne: a study of various composite instrumental techniques, this fragile music hung by an exquisite thread, teetering vertiginously on a knife-edge. Violinist Aliisa Barrière traversed the tightrope walk with exemplary presence of mind, a feat Collins later replicated in her solo turn, the beautiful cello feature Sept papillons. Aleksi Barrière discusses La Passion de Simone. Saariaho was elegantly soft-spoken in her brief remarks to the audience. Reading excerpts from her 2005 text "Earth and Air," she charmed the crowd with wry self-effacement—as did, in his own way, theater director Aleksi Barrière, who gave a fascinating talk on the evolution of La Passion de Simone, the composer’s meditation on the life of Simone Weil. Fresh from his own recent production of the work in France, Barrière provided an insider’s perspective on its untraditional dramaturgy and relatively "non-operatic" approach to musical continuity. 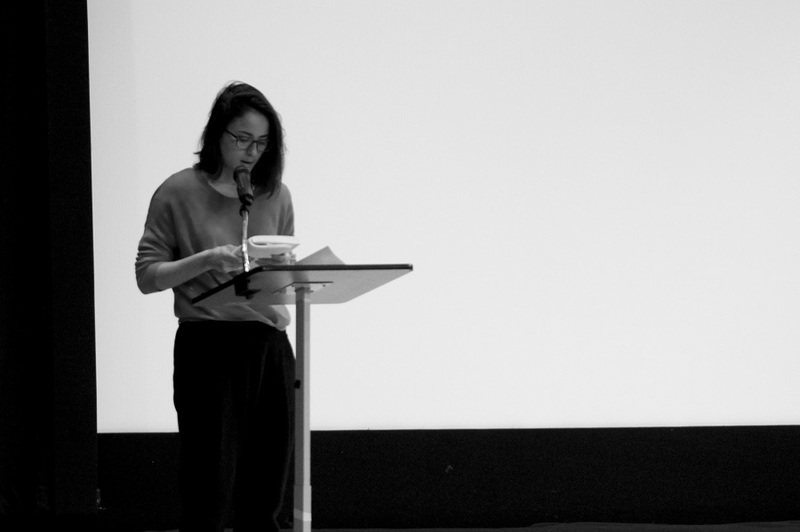 Mieke Chew then read a pair of tantalizing Can Xue extracts; first a teaser from the short story "The Bizarre Wooden Building," a characteristic portrayal of fantastic, imaginary spaces; followed by the opening of "Dust," a story translated into English expressly for M&L no. 5. These whimsical and somewhat malevolent tales were an apposite complement to Saariaho’s musical dreamscapes. (Left to right) Camilla Hoitenga, Tony Flynt, Hannah Collins, Lucy Shelton. In an endearing flourish of savoir faire, Saariaho returned to the stage one last time, where she unveiled the (unannounced) final act: a world premiere starring legendary soprano Lucy Shelton. Set to the opening words from The Tempest, it showcased Shelton’s versatile Sprechstimme alongside a sighing-shouting-singing trio of flute, cello, and Tony Flynt’s double bass. Unusually zany and rambunctious by Saariaho’s standards, the music threw sparks to keep the crowd warm, even as it filtered back out onto city streets still in the grip of a polar vortex. This event was made possible through generous sponsorship by the Consulate General of Finland in New York and the Royal Norwegian Consulate General, New York.